These were a test and I know they are a kitchen success when my two year old son asks for more. If interested in holistic lifestyle nutrition counseling for yourself or your family contact me at nmoneer@comcast.net. 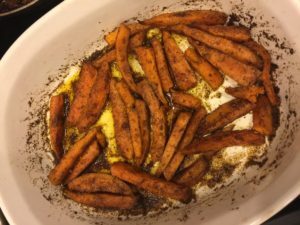 Place fries in ceramic dish and add in coconut oil, sea salt and taco seasoning. Then toss til potatoes are covered. Bake at 400 degrees in oven for 30 minutes or until tender with a fork. Then broil for another 5-10 minutes. Let cool 3-5 minutes and enjoy.